As a flight attendant for a major American airline, I’ve come to appreciate the many benefits my job has to offer. Obviously the travel perks are the biggest draw, but the salary is nothing to sneeze at either. My only work-related regret is that I don’t get to spend much time at home with my cherished cat, Ida. Luckily she’s one of the most independent felines I know, and one of my friends is always willing to come over to check on her from time to time. Last year I started to worry about her running out of food and water during one of my extended trips. 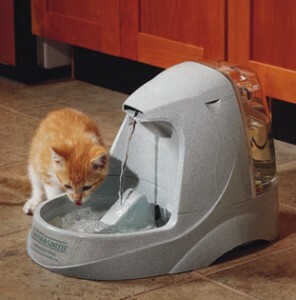 The though just wouldn’t leave my mind, so I immediately went online and found a Drinkwell cat fountain that constantly recycles fresh water. I solved the food issue by leaving a heaping bowl for Ida to eat at her own pace while I’m gone. Maybe one day I’ll find work that allows me to stay closer to home, but until then this will have to do.